Zepherine Drouhin is the perfect porch rose. When this is in bloom, the neighbors will think of a reason to visit. How do you greet visitors to your front door? In the old days folks usually planted a rose that would say the first hello. There’s nothing like stepping on to someone’s porch and there to be greeted by the bloom and fragrance of a rose. Porch roses are roses that fit the purpose of growing on the front porch of a home. There are several criteria that distinguish them as such. The best porch roses, first of all, need to be thornless. What would it say about you if you snatched, scratched and scraped every visitor at your door? Coils of barb wire don’t exactly say, “Greetings!”. So, a good porch rose should have few thorns. 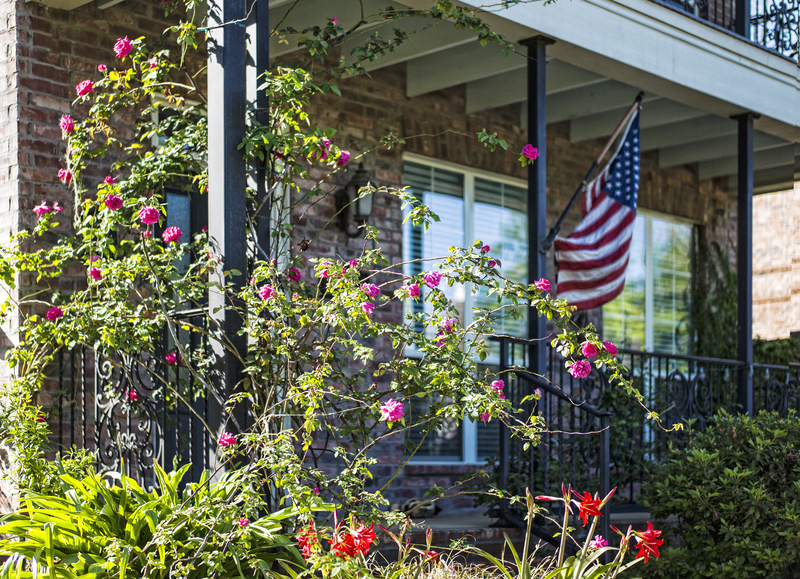 Next, a good porch rose should be beautiful and stunning when in bloom. First impressions at the door are always important, so the bloom of the rose ought to be pretty in and of itself. And I suppose we should add here that the rose ought to grow well. A sickly rose isn’t attractive, so a disease resistant and vigorous plant is important. An exceptional porch rose should be fragrant as well. Although this isn’t an absolute requirement, to step on to a porch and be drenched in the sweet fragrance of a rose is a delicious experience. The first rose is Mme Alfred Carrière . This is an old fashion rose that was originally grown in France in the 1870’s. It’s virtually thornless, although periodically a cane will produce a thorn or two. The blooms are semi double white with touches of pink. It has a strong fragrance and will reach 20 feet in height. Another old rose is Fortuniana. It was first brought to Europe from Shanghai, China in 1850 by the Scottish plant hunter Robert Fortune. This rose is vigorous and can grow quite large. It is a cross between Rosa Banksia and what gardeners know as the Cherokee rose. It makes a decent porch rose and is fragrant. Zepherine Drouhin is another old garden rose developed in France in the mid 1860’s and is in the Bourbon class of roses. In my view, this is the perfect porch rose. This rose blooms semi double cherise-pink flowers that are extremely fragrant. As a rambling rose, it blooms heavily in early spring, and then continues to bloom throughout the summer and will grow to a height of 15 feet. If you cannot find a Zepherine Drouhin, look around for Kathleen Harrop which is a close relative. It’s fragrant and blooms shell pink flowers. With these requirements in mind, let me suggest a few roses that will fit the bill. Since we’ve mentioned Rosa Banksia, haven’t you’ve loved the Banksia roses blooming around town? Both the yellow blooming Banksia is thornless as well as the white blooming Banksia. My friend Greg Grant tells me that he grows a white Banksia that is quite fragrant, although the yellow variety is scentless. The Banksia rose must be given a lot of space. I don’t think I would grow this rose right at my front door. But if you have a large, sprawling porch with plenty of room, a Banksia rose might be just the thing. There is a thornless R. wichuraiana. This is another Chinese rose, and it blooms with small white clusters of flowers. If you purchase this rose, make sure you get the thornless version. It can reach up to 20 feet so give it lots of space. Another thornless porch rose is Veilchenblau. It produces clusters of small flowers that open dark magenta and fade to lilac. Because the blooms on occasion appear blue, it is sometimes called the ‘Blue Rose’. It is thornless and sweetly orange scented. It, too, gets large. I’ve seen this rose at old homesites around San Augustine. Zepherine Drouhin is another old garden rose developed in France in the mid 1860’s and is in the Bourbon class of roses. In my view, this is the perfect porch rose. This rose blooms semi double cherise-pink flowers that are extremely fragrant. As a rambling rose, it blooms heavily in early spring, and then continues to bloom throughout the summer and will grow to a height of 15 feet. If you cannot find a Zepherine Drouhin, look around for Kathleen Harrop which is a close relative. It’s fragrant and blooms shell pink flowers. There are modern roses as well that will fill the bill as porch roses. Among them are Goldfinch, climbing James Galway, Snow Goose, Peggy Martin and a cute little rose called Climbing Pinkie. I suppose we live in a modern day, and we probably don’t think much about visitors coming to our front door. The most common visitor is probably the mailman or U.P.S. man. And we generally don’t sit out on the porch much. Maybe if we all grew porch roses we might reverse the trend. We might visit around- at least in the springtime. This entry was posted in Leica, PICTURES AND GARDENING by Jeff Abt. Bookmark the permalink.